VuRyte's Document Holder for Monitor Arms attaches to most standard monitor arms allowing you to position your documents next to your monitor and easily raise, lower or pull your documents closer as you work. A great solution for desktop sit-stand applications. 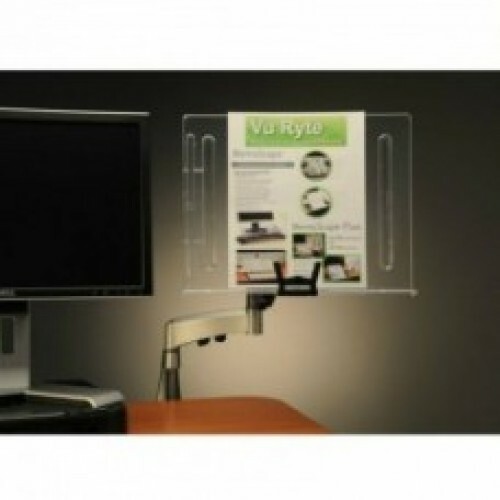 The clear acrylic easel is 14" wide to hold most documents and is also available in a wider 18" version (see the VUR-18MA). The generous 1.25" lip on the easel and document clip supports thicker stacks of paper or a small book. Kit includes easel, clip, and line guide. 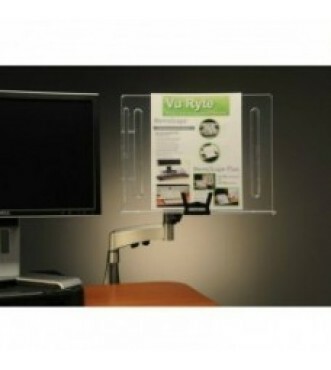 Includes hardware to attach to monitor arms with VESA 100 mm x 100 mm mount bracket. This easel is lightweight and works best on monitor arms without weight minimums as arms with spring mechanisms or gas cylinders designed to support heavier monitors may not stay positioned. Kit includes hardware to attach to any existing monitor arm with VESA 100 mm x 100 mm mount bracket and monitor arm without weight minimums. NOTE: Does not include monitor arm.